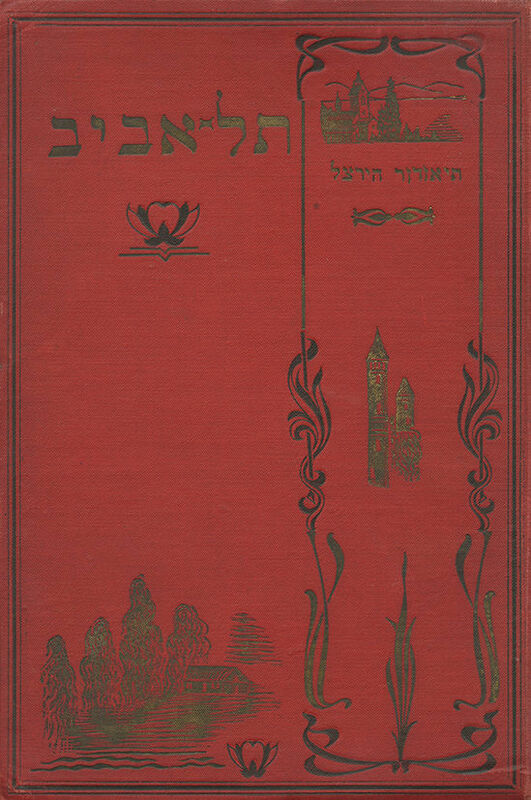 "Tel Aviv" – First Hebrew Translation of Theodor Herzl's "Altneuland"
Tel Aviv, a Story by Theodor Herzl. Hebrew: N. S. [Nahum Sokolow]. Warsaw: The Russian Zionist Organization, HaZfira Press, 1902 [on verso of the title page is a censure approval dated 1903]. First Hebrew translation of Theodor Herzl's utopian novel "Altneuland", published in German in the same year. The meaning of the Hebrew name is explained on p. 80: "And Friedrich whispered: Tel Aviv! (Altneuland: Tel – an ancient ruin, Aviv [spring] – resurrection, a new blossom). – Indeed!... This was an eternal ruin, a mound of ancient rubble, and now it is a mound of spring [Tel Aviv] and life. On our ancient land we have founded a new state". The present copy is hardbound, with gilt decorations and illustrations (embossed on the back binding are the name of the bookbinder and his address in Warsaw, in Russian). 319 pp, 21 cm. Good condition. A few stains. Ink stamps on the endpaper and the title page (with slight damage to text). Blemishes and rubbings to binding (mostly slight, and mostly to spine and corners).